First it was “Stoke City are in the Prem” and now, “Stoke are goin Wembley for an FA Cup Final, ah cost’ner belave eet”! Seriously though, Stoke City FC have experienced a dramatic turn in fortune in recent years, after a long period of absence from top flight football they at last achieved Premier League status in 2008. Then rather than struggle as many newly promoted teams before them have done, seem to have gone from strength to strength. So much so that this weekend, for the first time in their long history they have the chance to win the FA cup in the final being held at Wembley this Saturday, if they can overcome Premier League ‘rich kids”, Manchester City. 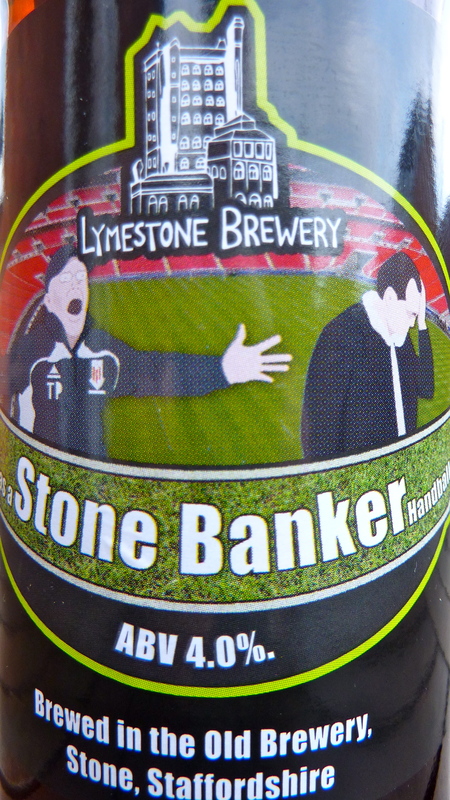 To mark this memorable occasion Staffordshire Brewery Lymestone have created an unofficial SCFC FA cup beer “Stone Banker”. Head brewer Ian (Brad) Bradford explains that the name comes from Stoke City manager Tony Pulis’s mixed metaphoric quote on West Ham’s equaliser in their recent FA Cup quarter final clash. Where Pulis described Fredric Piquionne’s control as “a stone-banker handball”. 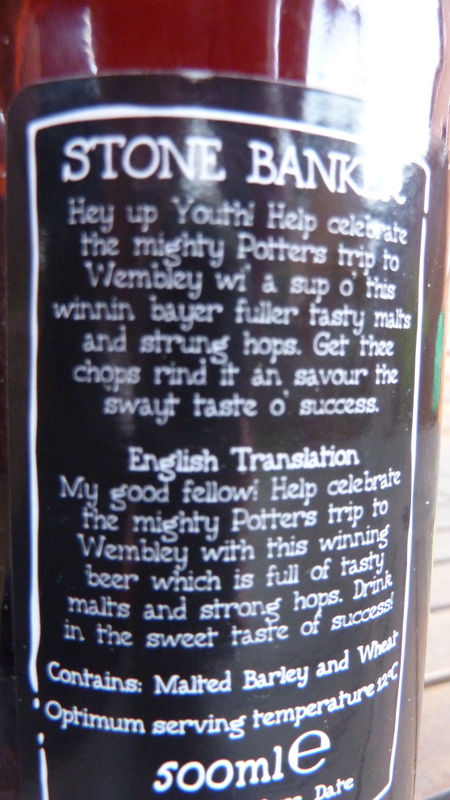 The label tries to relay that moment in cartoon form as does the beers description quoted in true Potteries “May Un Mar Lady” dialect. Stone Banker is a chestnut coloured bitter ale, pouring in bottled form at least with a vigorous light brown head which quickly recedes. Not big on the aroma front with a smell of light caramel malts. Tasting begins with a sweet malty flavour which turns swiftly to an almost savoury side with a quite earthy metallic hop bitterness. The finish is a sort of happy marriage between the two, with sweetness in the mouth and long lasting dry hoppiness. At 4% it’s a light but flavoursome and would make a perfect session beer to enjoy in the run up and then hopefully celebrating on Cup final day. Great beer weekend just gone with some crackers on show from Oakham in the form of the always reliable Citra & then a new brew, Styrian Goldings from their Ltd Edition “Oakademy of Excellence” range. I managed to get a sneak preview of this on Sunday as it was actually due on Monday night, it was a really refreshing beer with classic Oakham hoppy bitterness. On a second follow up tasting through the pump, the beer really comes into it’s own with a bright easy drinking honeyed flavour which balances the bitterness really well. Oakham’s tasting notes for reference: “A single hop varietal beer brewed to showcase Styrian Goldings. Then we had the Blarney Stone from Lymestone Brewery, this was a specially renamed version of Seven Stone Weakling 4.7%, it’s a light tan ale with a good combination of maltiness and hops which made it my beer of choice for most of Saturday night. The final offering from the UK was the recently SIBA voted Champion Strong Ale of Britain 2011, Allgates Mad Monk Imperial Russian Stout 7.1%. I have to say that I found this a little hard going, very tasty but seemed extremely heavy with the alcohol content very much in your face, I thought maybe it was just a step to much too quickly after the last beer. For scientific purposes only, I needed to try this again so had to go back last night and force down another, after all it didn’t win the award for nothing…. It is definitely a sipping beer, deep dark and rich with chocolate and coffee flavours. It is as I said earlier very heavy and you can really tell you are drinking a strong ale, I would buy it again but only in small doses as a late night finisher. The clear winner of the weekends best beer though from me I’m afraid goes to Belgium, although it does have links back to Blighty in name and style at least. 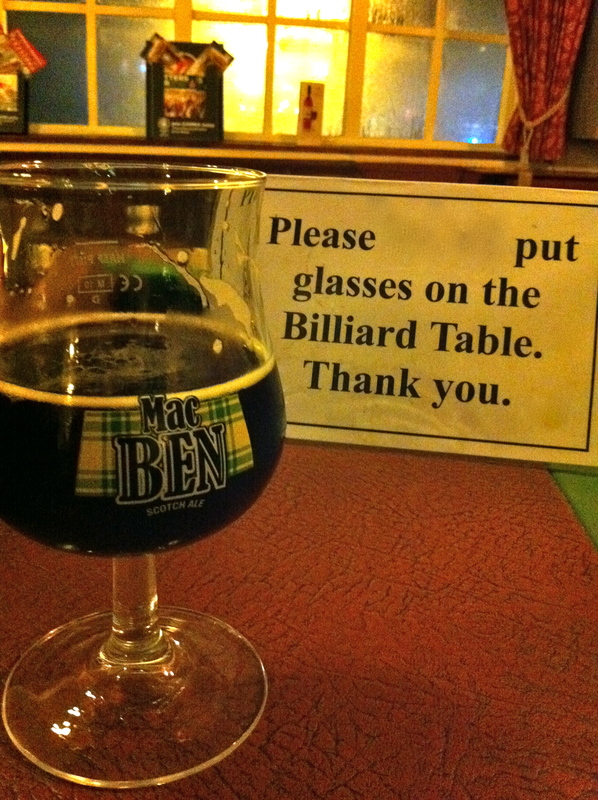 It was the absolutely deliciously more-ish St Feuillien Mac Ben Scotch Ale. From the first taste I was hooked. It’s a sweet but very drinkable beer, big on dark caramel malt favours but also a very prominent rich fruitiness. Pleasing tastes of alcohol flambéed bananas, with hints of chocolate and black cherries, a bit like a banana black forest gateaux! It’s the sort of beer that makes you want to curl up next to the bar and stay there until it’s all gone. Going back to the comments about the Mad Monk, this is the complete opposite in terms of the evident alcohol, you just would not think that it was a 7% beer which is a skill that most Belgian brewers seem to be able to replicate. 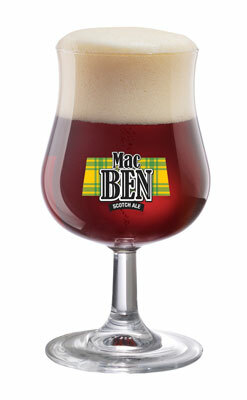 Mac Ben Scotch Ale is a light, very tasty beer to be enjoyed with friends. 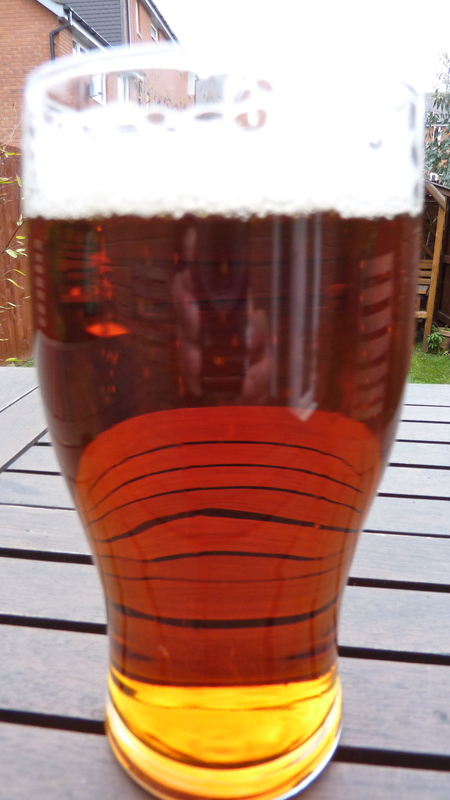 Its light brown foam unveils a rich composition of special malts; this is a generous, compact and stable beer. It is dark brown in colour with hints of red resulting from the malt being caramelised. It has a delicate, discreet flavour with a strong note of “roast barley” and hints of hops and orange peel. It is long, smooth and full to the palate with no roughness. Once more, the caramel and roast barley come together harmoniously to yield a range of almost silky sensations. Its after-taste prolongs an already positive first impression. Density: 7% alc. vol.